Old Trafford target into the final year of his Villa Park contract. 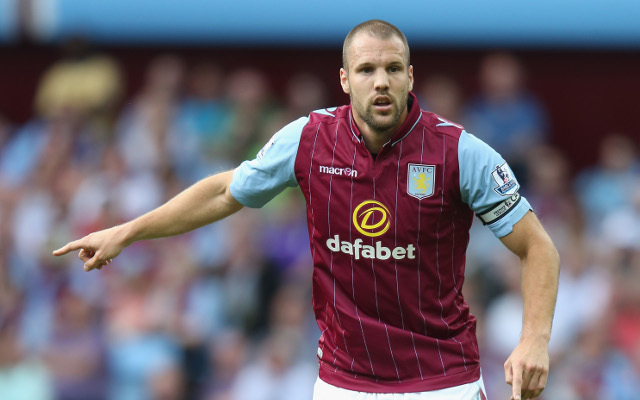 Aston Villa are desperately attempting to tie-down captain Ron Vlaar to a new contract with his current deal set to expire this summer according to the Daily Mirror. The 29 year old centre-back has been in fine form this season, after impressing at the World Cup finals, and is known to be a player both Man United and Southampton are courting. Aston Villa have started the season well but the last three campaigns has involved the club fighting relegation and as such the Dutch international may be reluctant to sign a new Villa Park contract. Man United boss Louis van Gaal knows Vlaar well and given the departures of both Rio Ferdinand and Nemanja Vidic the Old Trafford side could do with a dependable central defensive addition and the former Feyenoord man could be an ideal man for the job. One would imagine that Vlaar would jump at the chance of a move to reunite with his former national team coach at Man United and as such Paul Lambert may struggle to retain the tough tackler’s services.